Driving in Houston is pretty straight-forward. Everything is flat, it rarely snows and the most dangerous things Houstonians usually have to worry about on the road are rain and unexpected traffic back-ups at Shipley’s Donuts. But during the holidays, a lot of folks hit the road to be with their families, and it’s always a good idea to be prepared for driving outside of your comfort zone. It’s important to get your car serviced and inspected before a road trip. Topping off fluids, having the brakes and tires inspected, and getting an oil change are all good ways to prevent vehicle failure when far from home. Make sure you have jumper cables and a portable battery charger as well (in addition to the proper sockets or wrenches to remove the battery) in case your battery decides to quit. Check your spare tire to make sure it’s in working order, and make sure you have the jack, tire iron and key that you’ll need for changing a tire if necessary. If you’ve never had to change a tire on your vehicle before, a practice run in your driveway is a great way to make sure you’re not fumbling helplessly on the side of the road. If you’re heading for colder climates, being prepared for snowy driving conditions is the best way to ensure that your holiday problems begin and end with grandma’s turkey. The most important thing is to maintain proper distance. Leave plenty of room between you and other drivers as snow and ice can make braking and maneuvering more dangerous than normal. Simply take your time and share the road. 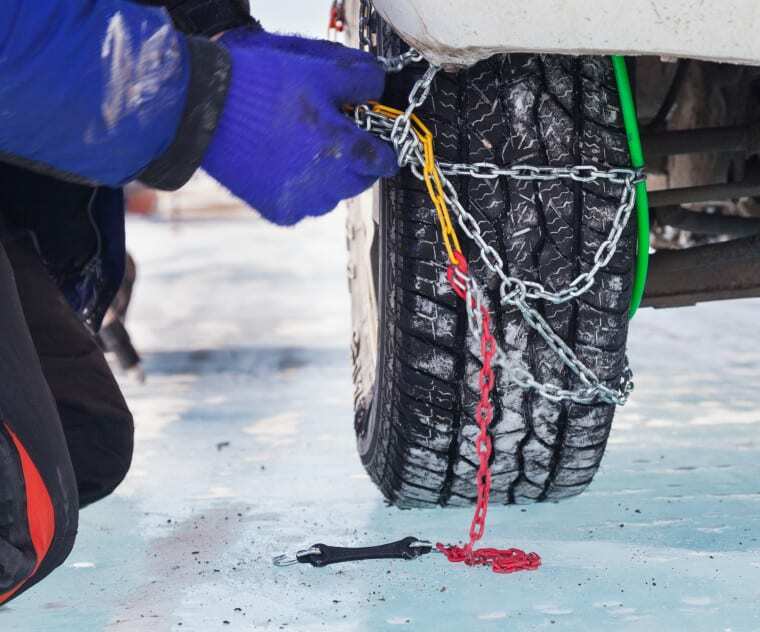 Snow chains can be helpful if you don’t want to spend the money on winter tires. While they may reduce fuel efficiency, they provide a crucial increase in traction. In fact, some regions legally require using tire chains, so consult this list of state laws to avoid tickets. The most important thing to remember when visiting cold weather regions is that danger from exposure is much more common. Severe winter weather can both strand you and make it harder for emergency services to find you. Pack extra blankets, an emergency kit, extra food and water, and some disposable heat packs to help you stay warm. Don’t be careless with your gas usage either. Always keep your tank above half-full so that you don’t run out of fuel the middle of nowhere. There’s a reason vacation and road trip movies warm our hearts. Whether it’s National Lampoon’s Christmas Vacation or Little Miss Sunshine, countless movies have shown us that being cooped up in a car on a long journey can be the perfect time to open up. Sure, you’re going to want to have books, movies, and your smartphone on hand, but be sure to talk to your loved ones as well. Remember, beyond the gifts and vacations, the holidays are truly about family. Even if you’re not on a trek to see distant relatives, there are still a few places in Texas worth driving to for Christmas cheer. Though most people head there in summer for river tubing and Schilitterbahn, New Braunfels is a great Christmas destination. Wassailfest is a wonderful way to celebrate with beer, German food, and a must-see Christmas Shoppe for any fan of holiday ornamentation. Just a short drive away in San Antonio there’s an amazing drive-thru light display at the Don Strange Ranch, and Galveston’s annual Dickens on the Strand is something all Texans should venture to and experience at least once. Cleburne throws a first-rate Christmas celebration with acres of Christmas lights, parades, and pony rides. College Station’s Christmas festivities show off the Aggie Christmas spirit. Hayrides, outdoor showings of Christmas films, western villages with unique gifts and artificial snow to frolic in bring the North Pole to life in the Lone Star state. As long as you don’t mind a short road-trip, there’s plenty of Christmas fun to be had in Texas. At Colony One we’re more than happy to take a look at your vehicle and tell you whether it’s fit for a quick trip across the Lone Star State or a drive to a distant relative in the northern states. Request a service today and start your holidays with peace-of-mind.